Hot Weather Means Hot Fishing!! Summertime fishing has been outstanding this year. And after a windy spring it is excellent timing for all of the families and vacationers that inhabit the Galveston and Kemah areas. The influx of tourists to our area beaches and our beautiful estuaries keep areas businesses including fishing guides very busy. We have had some great fishing days in July and it should keep going thru August. Open water areas have become accessible in our bay system with calmer conditions and trout green waters located throughout the complex. Every satellite bay system is producing fish and is fishable. Water temperatures have been in the upper 80's so the summertime pattern are beginning to kick in strong. As the ship channel pulls in cooler gulf waters a large migration occurs towards this area. 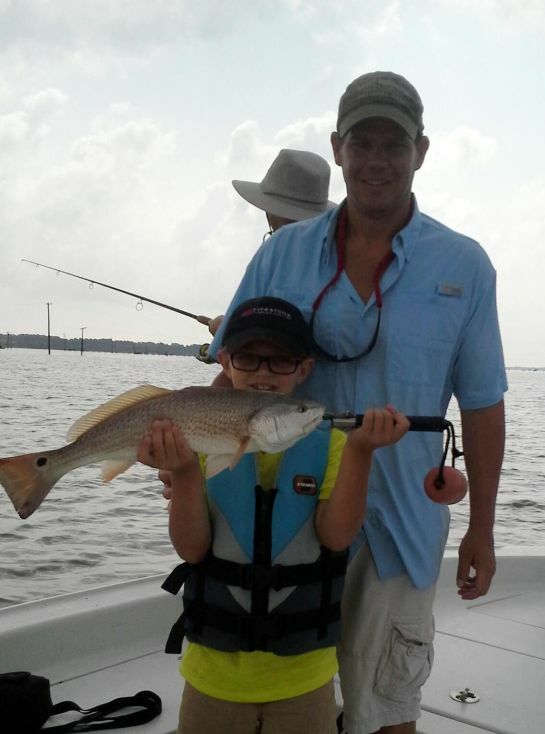 Reefs, spoils and wells in deeper waters are all potential structure and fishing havens to find a variety of species including speckled trout, redfish, shark, gafftop, sheepshead, black drum, sand trout and if you are lucky maybe even a triple tail or two. 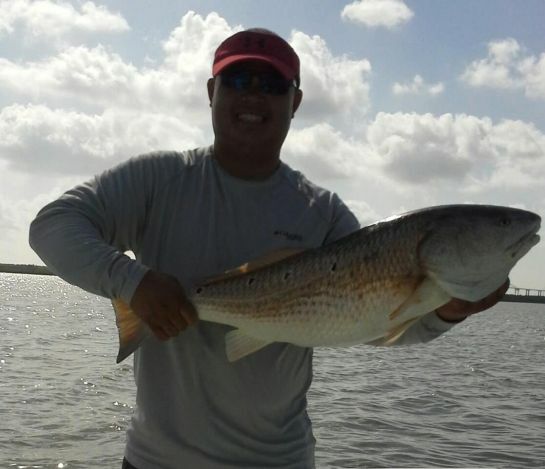 The migration to the middle of the bay seems to be in full force now and fishing from Eagle Point Marina in San Leon will put you closest to the channel and the action. As August approaches expect a slow migration north and a consistent deep water pattern for most gamefish. Deep water structure fishing with tout tails, croaker or live shrimp will keep bent rods abundant. The reefs in East Bay and wellpads in Trinity will continue to be consistent during feeding times and especially during midday when you have a changing of the tide and low wind. Topwaters will definitely work this time of year. I like throwing topwaters during low wind periods in the very early morning or midday. Typically between those periods I have a soft plastic lure of some type on a 1/4 oz jighead. A lighter jighead has been the key this past week and at times they have also wanted a straight retrieve with a pumpkinseed or chicken on a chain colored plastic. These past few weeks I have had a blast with tons of kids on the boat. I have been throwing live shrimp under a popping cork with a short leader and the kids have had a blast catching all species our bay has to offer. The main attraction has been the reds and they have been cooperating very well. 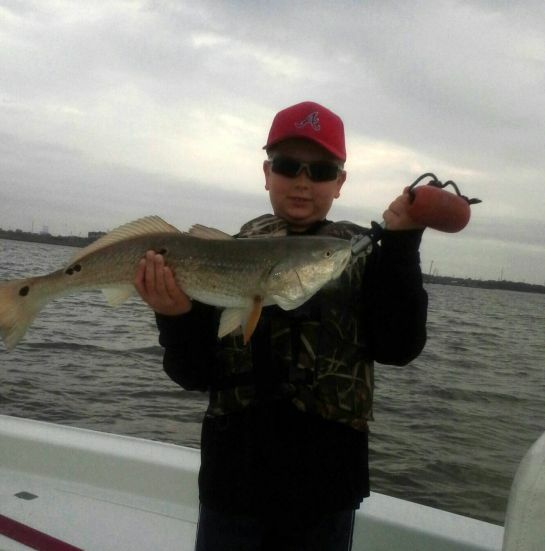 Speckled trout, black drum, sheepshead and a few catfish have slammed our natural baits and the action has been outstanding. As a guide the greatest thing to hear from kids is that they just had the greatest trip of their lives and I have been hearing that a lot here lately. Of course the croaker bite is still strong and will continue to be good until well into September but expect a shift towards shrimp as September approaches. Keeping those croaker lively and oxygenated is a major key to using croaker as a bait. At 8 dollars a dozen making the most of them is a wise decision for your pocket book. 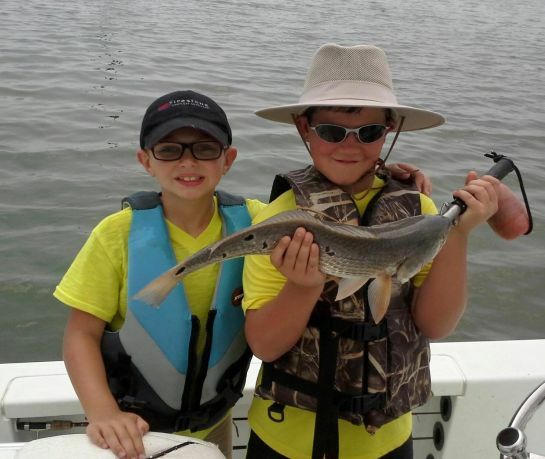 Dredging croakers seems to be the most popular method by most croaker guides for our bay system. Capt. George Knighten does not get enough credit for perfecting this technique back in the late 90's that he created on his own and taught to others. I have to admit that getting that good thump when a trout first strikes that croaker is enough to get your adrenaline and excitement level at a maximum. 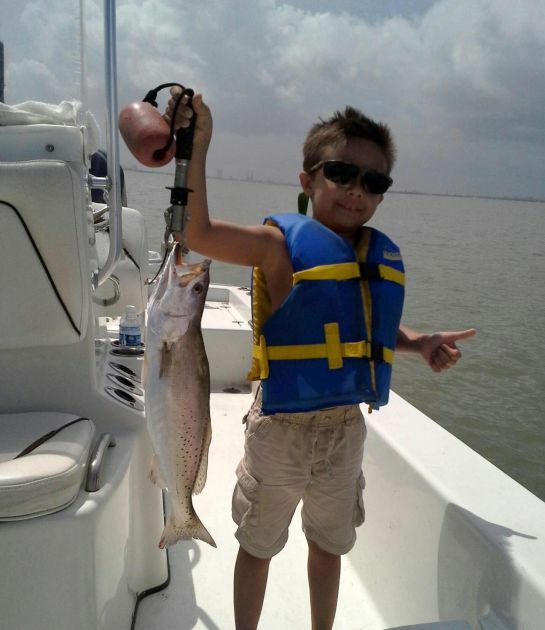 There are a few weeks left before school starts so make sure and get those kids out on the water and get them hooked up. Having the privilege of taking hundreds of kids on my boat I can see how special these days are to them and special days are great days so TAKE A KID FISHING!! When you say dredging a croaker, what exactly do you mean? Also, I had some success last Saturday, but was unable to find any keeper trout, everything I caught just under 15", any tips on how to get bigger trout? Nothing will increase the size of your trout except to find a school of bigger fish. For that you have to just put in the time and fish a lot.